Summer is in full swing in Ottawa and with that comes a lot of yard work and putting your small engines to work. In addition to maintaining your small engines with tuneups and repairs you will also need to maintain your lawn. With summer here it is likely that you are mowing and watering your lawn frequently but you may still be finding yourself not quite getting the results you are looking for in your yard. 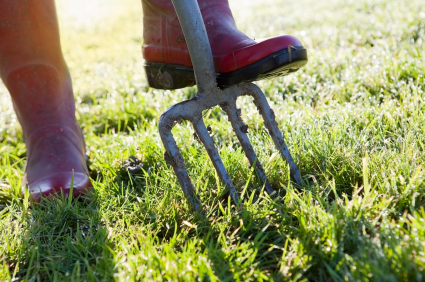 Check to see if your soil is compacted from the traction and if there are clamping down on roots which will limit the growth your lawn can expect. Lawn aeration is a great solution that can create a beautiful and healthy lawn. Usually the spring and fall are the best months to aerate your lawn so you may be asking yourself if it’s too late to do so in the summer time. The simplest answer to this question depends on the type of grass species that you have in your lawn. There are grass identifier tools online that can help you determine the species you have and one thing to note is that warm season grasses usually grow in southern regions while cool season grasses are found in northern climates. For cool season grasses it’s best to hold off until late summer and early fall to aerate cool-season grasses. So basically for most grasses in Ottawa it’s best to avoid aerating in the summer. However, there are some exceptions as we discuss below. Maintaining a lawn can be overwhelming at times and with all of it you still have to repair your small engines and tune up your lawn mower etc. that can feel like a lot at times. Not to worry as most of us only aerate our lawns once a year or even every other year in some cases. Whether you choose to do it now or next year is not a big deal and you can use an aerating tool or rent a machine to do the work for you. Whichever option you choose you will be happy with the results of properly maintaining your lawn.